Quick. Go to this page and fill out the form. 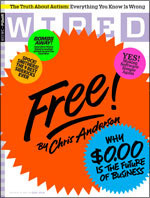 You’ll get a completely free, no obligations copy of the latest Wired magazine. Only 10,000 available, so act fast! Wired is currently my favorite magazine – even more than Fast Company. I look forward to getting it in the mail each and every month, and really enjoy the varied and unexpected stories. This issue include the cover story on the “future of free“, an interesting piece on the recent Netflix Prize, and a fact-challenging piece on autism, among the regular monthly content. If you’ve never checked out Wired, now is a great time to take a no-risk peek. If you do, let me know what you think!